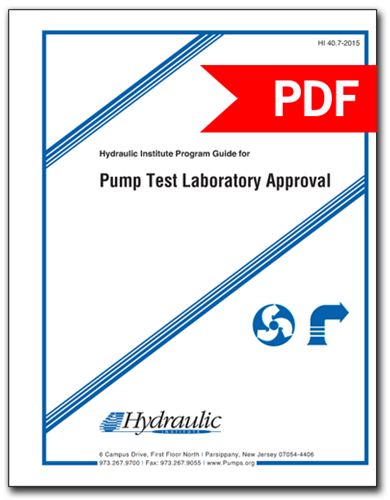 Purpose: The purpose of the Hydraulic Institute (HI) pump test laboratory approval program is to establish a pump test laboratory audit and inspection program to approve a pump test laboratory’s ability to test the performance of certain products to test standard(s), and adhere to the requirements of an international test laboratory accreditation standard (ISO 17025) concerning test measurement equipment. History: The HI Pump Test Laboratory Approval Program was created to verify a pump test laboratory’s practices in the performance testing of rotodynamic pumps to assure regulatory agencies and power administrations who provide incentive rebates that pump performance reported by an approved test laboratory was acquired consistent with the standards identified in Section 40.7.1.6. This program guide is offered as a freely downloadable document in PDF format from the Hydraulic Institute.